If you are looking for interesting ways to liven up your holiday cocktails, consider tea concentrates! With a little prep work, your concentrates can last for about one week, always on the ready for a tasty cocktail. Large gatherings. Make a tea concentrate, then dilute with hot water (or cold for iced tea). Use one teabag (or one tsp of loose leaf) per person in about 1 L of hot water, or as much as your teapot holds. Infuse at for the amount of time and temperature as suggested. Cooking: Make a strong concentrate and add to your favourite dishes. Tea makes a great marinade for meats. It also makes great salad dressing, soup broth, rice and more. Marinade: Choose a tea that will compliment your meat or vegetable of choice. Our favourite for meat is Lapsang Souchong, which imparts a grilled, smoky, campfire flavour. Add concentrate to your favourite marinade to taste before adding to your meat/veggies. Salad dressing: Try green tea concentrates for salad dressing. Imperial Dragonwell works especially well for dressings. Reserve the tea leaves after infusion, and finely chop the tea. Mix the infusion with lemon juice, olive oil, salt, pepper and chopped tea leaves and add to any green salad. Soup broth: We tried this on Valentine's Day with White Peony.Infuse tea in water, add vegetables to make stock. Then add your soup ingredients (we made ours with tortellini). Baking: Make a concentrate and make a reduction by adding sugar and simmering on low heat until thickened. Use in replacement of plain sugar/honey/syrup. Iced tea: Make a tea concentrate and dilute with cold water and ice for a quick iced tea ready in minutes. Cocktails: Use your tea concentrate in place of soda or juice for healthier flavour. Lattes: Add your concentrate to steamed milk. Snow cones! Once your concentrate is ready, simmer in a pan with your favourite sweetener to create a syrup. Pour over shaved ice! Use 1 tsp of tea per 1 oz of hot water. *Note* If you don’t have a thermometer or a kettle with temperatures, you can instead bring the water to a boil, then allow to cool (uncovered) for about 5 minutes. That should bring the temperature down around 75-85°C. After infusing, filter the infusion through a fine mesh strainer. I also like to filter it a second time through a biodegradable paper coffee filter or clean cloth to get all the fine particles that may lead the tea dust to continue infusing. As mentioned above, your concentrate will last for about one week in the fridge. Now, back to cocktails. We have a few recipes that are great for cool weather and holiday festivities. Teas with spices like cinnamon, ginger and pepper are warming, and perfect for days you want a cold drink but don’t want to feel cold. Masala chai is full of warming spices. Use this concentrate with whisky, rum or brandy for best flavour. If you like a stronger cocktail, mix an ounce of concentrate with 1-2 oz of your alcohol of choice. For a lighter cocktail, add water or club soda. Note that the concentrate has a strong flavour, it is difficult to add sweetener to taste to the concentrate. We recommend adding sweetener to the drink afterwards to taste. If you prefer to sweeten your concentrate, start with 1-2 tbsp of your favourite sweetener. Prepare a beverage and taste it. Mix water and tea together. Infuse for 2 minutes. Strain tea from infusion. Our favourite way to serve this is with an ounce of whisky, sparkling water and a touch of lemon juice with a lemon twist over ice. The lemon really helps to enchance the flavours of the spices plus it makes a great adult cold and flu tonic! There is a reason this is our best-selling seasonal tea of all time! Winter Wonderland is holidays in a cup. Using this tea and a few simple ingredients, you will have the perfect holiday cocktail. Mix water and tea together. Infuse for 2 minutes. Strain tea from infusion. Double strain it through a fine mesh to remove all the small particles. For an easy and delicious cocktail, we suggest muddling some coconut sugar in a glass, add ice, 1 oz of your Winter Wonderland concentrate, 1 oz of whisky or rum, sparkling water and an orange peel garnish. Talk about holiday flavours! Hibiscus is fantastic in concentrates, especially in the summer, but can be used all year. Hibiscus is slightly sweet, quite tart and very refreshing. It's caffeine-free, so it's perfect for all ages. Use it in salad dressings, iced teas, mocktails and cocktails. Let us know if you have a favourite way to use hibiscus (besides as tea!) in the comments below. Interested in concentrates for your business? Making tea concentrates can make service much faster! You can create a strong chai concentrate and just add it to frothed milk for an instant chai latte (same applies with any other tea for a tea latte). Tea is great in soups, salad dressing, baked goods, sweets, sauces and in cocktails. 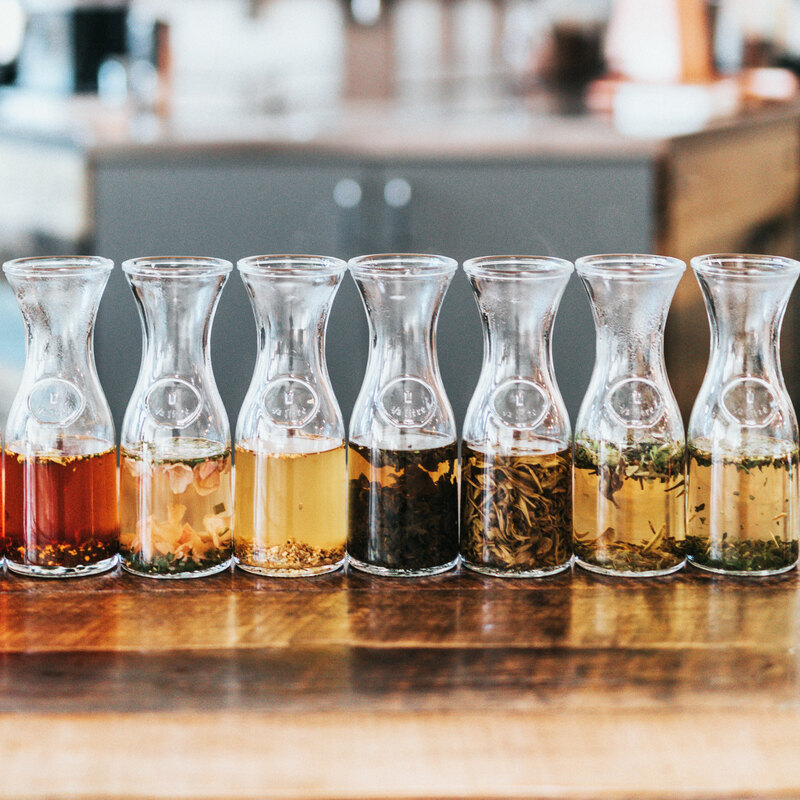 If you would like to learn more, or get feedback from our Tea Master, please contact info@shantitea.ca.